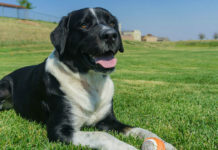 Designer mixed breed dogs are becoming increasingly popular, and Labrador retriever mixes, including the American bulldog Lab mix, are at the front of the pack when it comes to favorite cross breed dogs. Are you interested in an American bulldog Labrador mix? We’ll take an in-depth look at this mixed breed dog, as well as the designer dog trend in general, so you can decide if the American bulldog and Lab mix is the right dog for you. This crossbreed is commonly known as the American Bullador. Mixed breed dogs known as Bulladors (or Labrabulls) are generally Labs who have mated with English bulldogs. Given the health issues of English bulldogs, is the American bulldog Lab mix a better option for potential owners concerned about getting a healthy dog? Before we look at each parent breed, let’s take a closer look at first generation mixes, aka “designer” dogs. 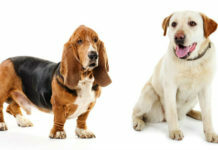 What’s the difference between a purebred dog, a designer mixed breed and a good old-fashioned mutt? 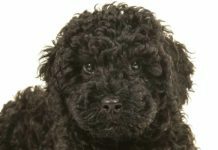 True purebred dogs typically have a known pedigree and are registered with an official breed organization such as the American Kennel Club (AKC). Designer mixes are a crossbreeding of two purebred dogs of different breeds, while the hereditary background of a mutt is usually unknown. You can learn more about the purebred versus mutt debate here. 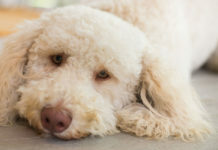 Since inbreeding can occur in some lines of purebred dogs, outcrossing with dogs of a different breed (or separate lines of the same breed) can be beneficial. But a designer mix isn’t always healthier than a purebred. The best way to ensure the health of your American bulldog x Labrador puppy is to work with reputable breeders who know their dogs’ genetic lines and test for inherited health conditions. Next up, let’s look at both parent breeds and the American Bullador mix. The American bulldog is not recognized by the AKC and does not have an official AKC breed club. The United Kennel Club (UKC) is a good alternative resource on the American bulldog and other popular breeds. According to the UKC, the American bulldog arrived in the southern United States with immigrants from Britain and retains the appearance of the original bulldog before the breed evolved into the English bulldog we know today. The American bulldog is a working and guardian dog. The breed was originally used on farms to work with livestock and guard property. There are two main types of American bulldog. The Scott type (also called “standard”) is sleek and athletic, with a fairly long muzzle. The Johnson type (also called a “bully”) is bulkier and heavier, with a shorter muzzle. The Labrador retriever originated in Newfoundland Canada as a water dog, working alongside fishermen. The breed’s love of water and famously appealing temperament soon made it a favorite waterfowl-retrieving dog among hunters. For over a quarter century, the Labrador retriever has been the most popular dog breed in the US. Purebred Labs are the dog of choice for many families, although Lab mixes are also increasingly popular. 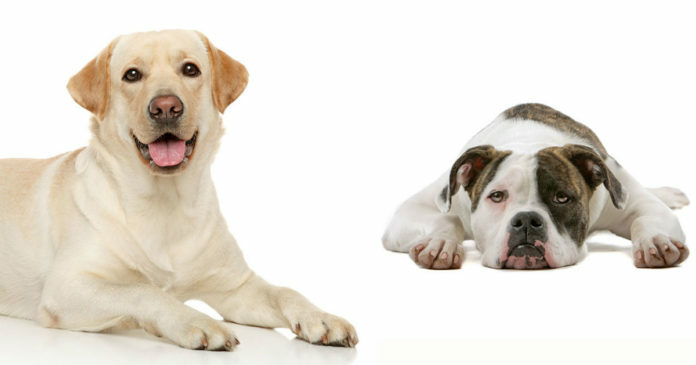 The American bulldog and Labrador mix has been a popular crossbreed dog for many years. Although not as trendy as recent Lab mixes such as the Labradoodle, the American Bullador is often said to have an ideal combination of the American bulldog’s protectiveness and the Lab’s devotion. Before we look at temperament, let’s see how big your American Bullador puppy will get when fully grown. The most important thing to keep in mind when considering a mixed breed dog such as the Labrador American bulldog is that the cross can have any combination of the physical traits of each parent breed. The breed standard for the Labrador retriever states that males range from 22.5 to 24.5 inches high at the shoulders, and females stand 21.5 to 23.5 inches tall. The weight range for male Labs is 65 to 80 pounds, and for females it’s 55 to 70 pounds. 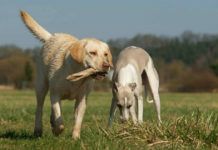 Labs are sturdy, medium-sized dogs, athletic and well-proportioned. While physical appearance varies between the Scott and Johnson types of the American bulldog, the breed should look powerful, strong and athletic. A “standard” dog will be somewhat lean while a “bully” will be stockier. Expect a male American bulldog of either type to range between 22 to 27 inches high at the shoulder and females between 20 and 25 inches. No weight range is given by the UKC, but the dog’s weight should be in proportion to its height. 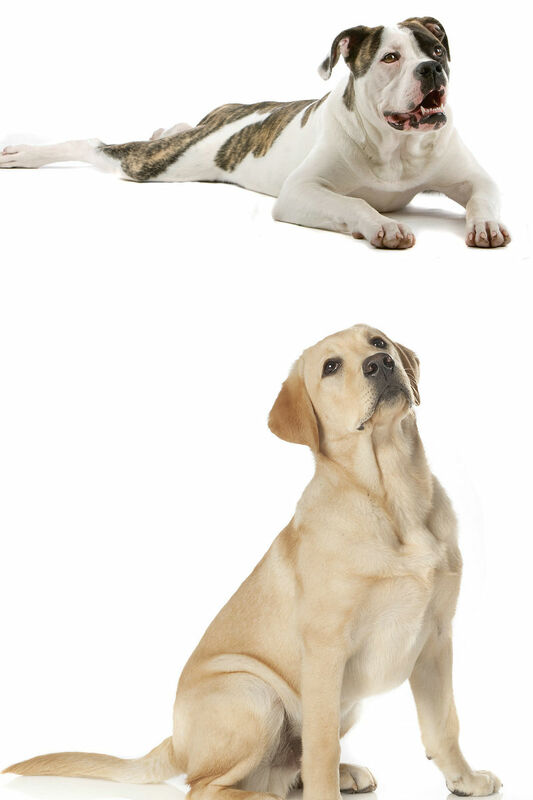 What about the American bulldog cross Labrador? Given the height and weight ranges of the parent breeds, the size of an American Bullador can vary. Generally, expect a weight range of between 55 and 85 pounds, with males on the heavier end of the scale and females on the lighter end. What about height? This can also vary quite a bit among individual dogs. The maximum height is around 25 inches, although many individuals can be shorter. Many potential owners are interested in the coat color, length and grooming requirements of the American Bullador. Is it a low maintenance mixed breed? The American bulldog has a short, close coat, no longer than an inch in length. It can be any color or combination of colors, except solid black or blue, merle, or tricolor (white/black/tan). While the American bulldog’s coat is relatively low maintenance, the Labrador has a short but dense double coat. The undercoat provides protection in cold weather, but it does shed seasonally. Labs require regular weekly grooming with a slicker brush, and daily grooming may be necessary during times of heavy undercoat shedding. Labs have three recognized coat colors: solid black, yellow or chocolate. What about the mix? 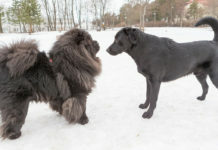 As with size, it’s important to remember that your American Bullador could have the coat characteristics of either parent breed, or a combination of both. Generally, the American Bullador has a short, low maintenance coat that will need a weekly brushing. If your dog has a thicker Labrador-type coat, more grooming may be required. Many coat colors and markings are possible in the American bulldog Lab mix. The most common colors tend to be black, brown, yellow, red or tan, often combined with white. There are more coat color and pattern possibilities with the American bulldog, so whether the Lab parent is black, chocolate or yellow, the puppies can have quite a range of colors and markings. Like appearance, the personality of a mixed breed dog can never be guaranteed. Your American Bullador could be more Lab-like, more of a classic bulldog, or any combination of both. Labrador retrievers are known for their friendly, kind and eager-to-please nature. They are intelligent, gentle, and neither timid nor aggressive. Since the American bulldog was bred to guard property as well as work with farm animals, its personality is quite different than the Lab’s. While as gentle and loving with its family as any Lab, the American bulldog is a confident dog that may be aloof with strangers. The American bulldog should not be overly shy or overly aggressive. What about the American Bullador personality? The ideal American Bullador is loyal, brave and protective of family. Because that Lab friendliness can be tempered with some bulldog assertiveness, proper training and socialization is essential. Start training and socializing your dog from puppyhood. Since that bulldog blood may make your dog somewhat strong-willed, be patient and remember to use only positive reinforcement training methods. Always supervise your American Bullador around children and unfamiliar dogs. The protective nature of the bulldog side can lead to some aggression, which is why good training and socialization are so important. What kind of inherited health issues can you expect in a Labrador American bulldog mix? Because it is such a popular breed, the Lab has some well-documented health problems. But what about the American bulldog? Let’s look at both. Most purebred dogs have some genetic health conditions, including the Labrador. The most common issues seen in Labs are the joint diseases known as hip and elbow dysplasia, some heart, eye and neurological problems, and a genetic predisposition to obesity. Responsible Labrador breeders will test their dogs’ health and avoid breeding carriers of genetic health conditions. Reputable breeders will also share all health testing information with clients. The American bulldog also has some genetic health conditions that can be passed on to crossbred American Bullador puppies. A skin condition called autosomal recessive congenital ichthyosis (ARCI) is caused by a genetic mutation. American bulldogs can also be prone to an eye disease called pigmentary uveitis, which causes glaucoma. Because of the inherent structure of the American bulldog’s head and muzzle, specifically the flattened nose and undershot jaw, the breed can suffer from a range of respiratory problems grouped under the name brachycephalic syndrome. Dogs with this syndrome may have trouble breathing, be prone to gagging, experience exercise intolerance (or collapse), and be sensitive to heat and humidity. While the American bulldog’s shortened muzzle is less extreme than the English bulldog’s, it’s important to be aware of the health risks of this type of facial structure when considering a dog with bulldog characteristics. Responsible American bulldog breeders will ensure that only healthy dogs are used in their breeding stock and will provide all health testing information to their clients. American bulldog Lab mix puppies can inherit genetic health problems from both the Labrador side and the American bulldog side, so it is important to get your dog from a reputable breeder. Let’s talk about how to ensure that you are getting a healthy American Bullador puppy. You’ve decided that the American Bullador is the right dog for you. How do you find a healthy puppy? Because designer mixed breed dogs are so popular, be sure to choose your American Bullador breeder with care. A puppy bought over the internet or at a pet store could be from a large-scale breeding operation known as a puppy mill. It’s best to choose a small-scale breeder who welcomes potential buyers into their home. You should be able to observe the conditions of the kennel, talk to the breeder, and see the parents and littermates of your puppy. Your breeder should provide you with a health history of your puppy’s parents, including all genetic health testing records. X-rays for hip and elbow dysplasia can be officially certified by the Orthopedic Foundation for Animals. Your puppy and its littermates should have clean eyes, noses and bottoms that are free from discharge. Choose a puppy that is lively and not overly shy. Make sure that the puppies’ living conditions are clean and spacious, and that they are not confined in cages. It is also possible to adopt a homeless American bulldog Labrador mix, especially if you want an adult dog. Check with local breed specific rescue groups for both the Labrador retriever and American bulldog and tell them that you are interested in a mix. Remember that a dog is a lifetime commitment, so be sure that you and everyone in your household are prepared to welcome a new canine companion into the family. Enjoy your new best friend. Next articleCan Dogs Eat Avocado: Is It Safe to Share Your Fruit?